The General Assembly of the Spanish Association of Machine Tool, Part, Tool and Accessory Manufacturers was held last 11th May in the Auditorium of the San Sebastian Technology Park. César Garbalena, Managing Director of LOIRE-GESTAMP, has been elected as the President of the Association replacing Antxon López Usoz. 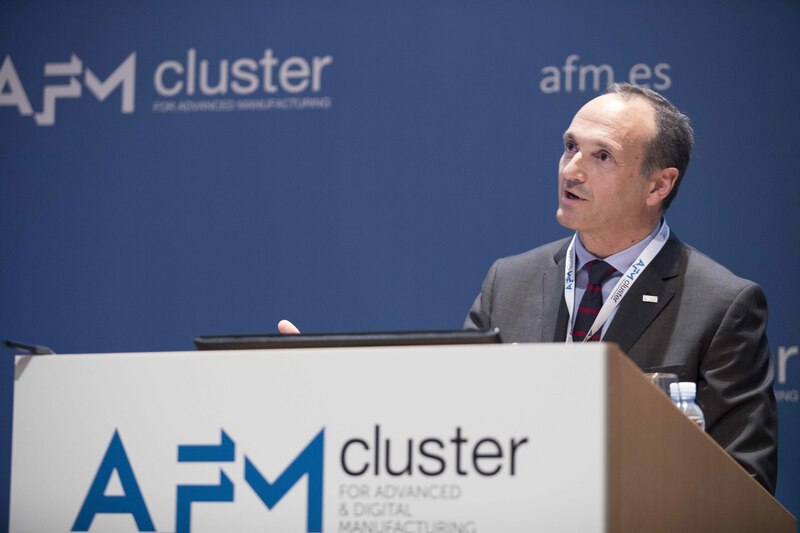 César Garbalena was elected as President of the Association of Machine Tool, Part, Tool and Accessory Manufacturers, AFM Advanced Manufacturing Technologies, for a term of two years, during the annual meeting of the association. Garbalena, (Pamplona, 1961) is the Managing Director of LOIRE-GESTAMP. LOIRE-GESTAMP is Spain’s largest manufacturer of hydraulic presses. It has been based in Hernani (Guipúzcoa) since 1962 and has premises of over 8,000 square metres, where presses are designed and manufactured for use in production plants all over the world. LOIRE-GESTAMP has been member of AFM for more than 50 years. The new president of the sector association has also extensive experience in AFM, which he has been a board member of since 2012 and board secretary since 2014. He is also Vicepresident of CECIMO, the European Association of Manufacturers which AFM has been a part of since 1962. At the AFM general assembly after the presentation of the 2017 results and plans for 2018, the lecturer Emilio Duró spoke as a guest speaker with a talk entitled “No vale rendirse” (Do not give up). During the event, the association paid tribute to one of its heavyweights, Miguel Lazpiur, for his extensive and successful career in the advanced manufacturing sector, awarding him the AFM gold badge. The closing ceremony was attended by Eneko Goia, Mayor of San Sebastian; Arantza Tapia, Minister for Economic Development and Infrastructure of the Basque Government and Markel Olano, Head of the Provincial Council of Gipuzkoa. Together with them, Javier Zarraonandia Deputy Ministers for Industry and the Managing Director of SPRI, Alex Arriola. From the world of business, there were the Chairman of Confebask, Roberto Larrañaga and the Managing Director, Eduardo Arechága; the Chairman of Elkargi, Josu Sánchez and the Chairman of Mondragon Corporation, Iñigo Ucín, as well as representatives from numerous companies associated with AFM.